Kid friendly businesses, organizations and services in the Des Moines area. 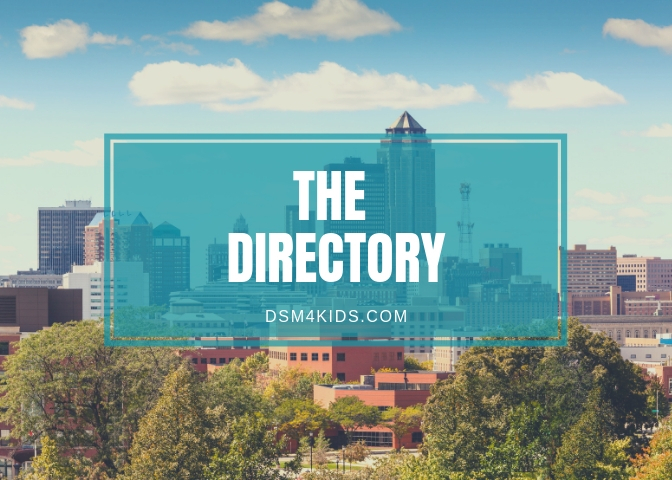 Whether you live in Ankeny, Altoona, Clive, Des Moines, Grimes, Indianola, Johnston, Urbandale, Waukee, Windsor Heights, West Des Moines or beyond, find the local resources your family needs in in the dsm4kids Directory! While all submissions are considered, inclusion in the Directory is based on relevance. Businesses or organizations outside of Central Iowa or primarily geared toward adults may not be listed. If you are a business or organization and would like to submit a directory listing, please click on Submit Business Listing. dsm4kids wants to help you find the best activities for your family. Sign up for our Weekend Fun Guide to be sure you don’t miss a thing! Aquatic Center in Altoona, IA. Offers outdoor swim lessons, parties and events, and facility rental opportunities. We are an innovative visual arts organization providing gallery space for local artists and art classes for all ages. All exhibits and receptions are free and open to the public. We are dedicated to supporting local artists, providing educational development and a diverse art experience for people of all ages. One of the world’s largest collections of flowering crabapple trees can be found at Water Works Park. The collection is properly named after its developer, horticulturist and author, Arie Den Boer; he was the collector and originator of the arboretum in 1930. He established a collection of 300 varieties of trees in his time, which Des Moines Water Works staff now maintains through pruning and propagation. Arie Den Boer was perhaps the first successful nurseryman to popularize the crabapple tree with his bookOrnamental Crabapples, published in 1959. His book gave a nurseryman a different take on the crabapple, warts and all, and explaining the tremendous diversity of this plant in the landscape. Today, the arboretum includes approximately 1,200 trees in the collection, with the youngest trees being planted through a donor tree program. At this time, we are no longer accepting donations for new trees in the arboretum; however, a donation can be made to the maintenance and care for the existing trees in the arboretum by contacting Des Moines Water Works at 515.283.8702. The annual crabapple blossom usually blooms the last week of April and the first week of May, attracting thousands of visitors to Water Works Park. The Ashton Observatory building was a collaborative effort between Jasper County and The Des Moines Astronomical Society, Inc. The Observatory is about a 20 minute drive northeast of Des Moines, near the intersection of Iowa highway 330 and county road F17. The site is nestled within the beauty of Ashton-Wildwood County Park and has superior viewing avenues in all directions. The observatory has two domes, one housing a 16 inch f/4.5 Newtonian style telescope, and the other has a research-grade 16 inch Meade LX200 GPS Schmidt-Cassegrain telescope. Swimming Pool managed by Des Moines Parks and Recreation. Offers swim lessons, events, and facility rental. We're an accessible local market with abundant produce, prepared foods and crafts, plus live music and fun activities, open June to mid-September. We welcome your ideas, comments or questions; reach us on Facebook or email info@beaverdalefarmersmarket.org. Located next to the headquarters of Better Homes and Gardens' parent company, Meredith Corporation, our Test Garden serves as a display garden, a testing ground for plants, and a photography studio for our company's publications and Web sites. The Test Garden is open to the public on Fridays from noon to 2 p.m., from May through September. Large groups may schedule tours during these hours. For more information, contact the Test Garden Manager, at Better Homes and Gardens, 1716 Locust Street, Des Moines, IA 50309. The phone number is 515-284-3994. Trails for hiking, biking & snowmobiling plus swimming, boating & fishing on the lake; no camping.